When I first got seriously into raw vegan food, it was about 2009. Funnily enough I had already been eating a very high raw diet for a few years already, but you know, the simple stuff. Lots of fruits and salads. That kind of stuff. And then I dived right in to a 100% raw food diet in 2009 and of course, that inspired me to get cracking on some proper raw recipes. 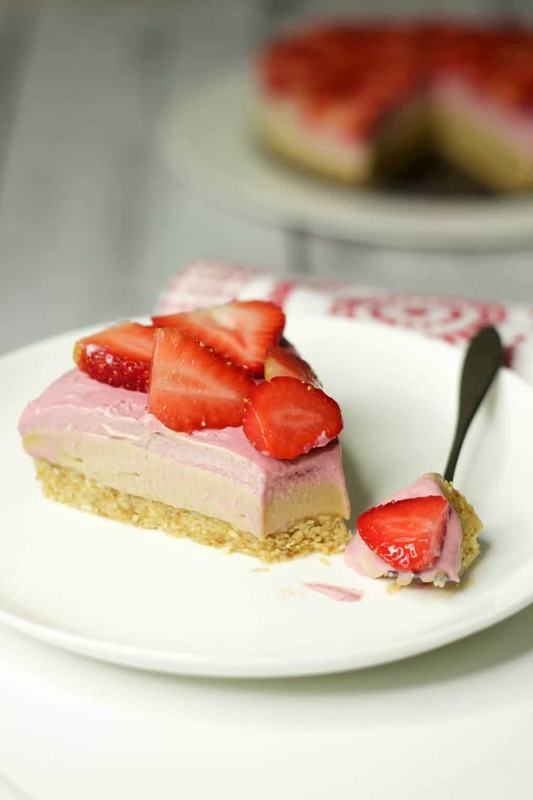 And the first time I made a raw cheesecake, I think I actually did swoon. Now I was recently reading about how ridiculous it is to ever write the word ‘swoon’ in reference to food. And I guess I sort of agree, but in this case, I think I did swoon. At least a little bit. Let’s call it a mini swoon. 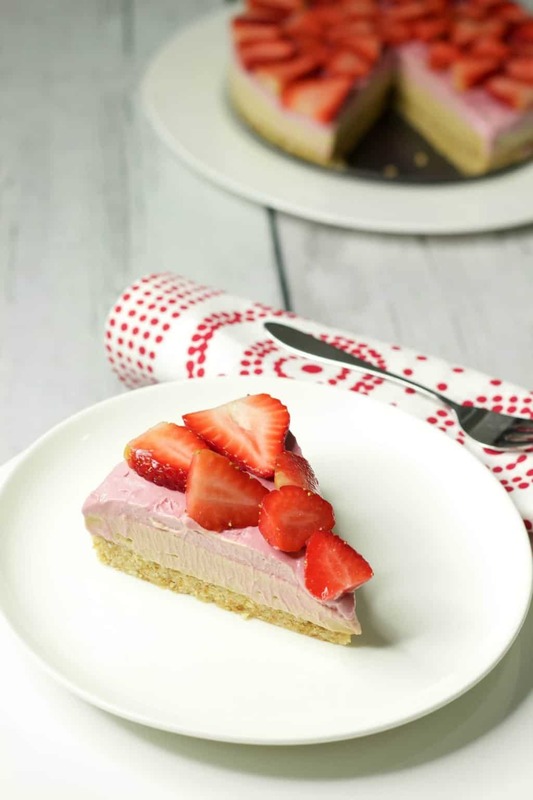 Because that first raw cheesecake (much the same recipe as this cheesecake below by the way), was so damn good it deserved a swoon. But that was in the days when I thought if it was RAW, it meant you could eat as much of it as you could ever fit in your body and it would be FINE! Hehehehe, that isn’t quite right. 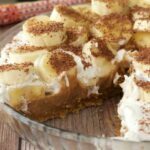 Just because it’s raw doesn’t mean you should eat the whole pie. But actually I’ll shut up now, if you wanna eat the whole pie – you go girl (or guy!). Don’t let anyone tell you you can’t! You don’t need that kind of negativity in your life. 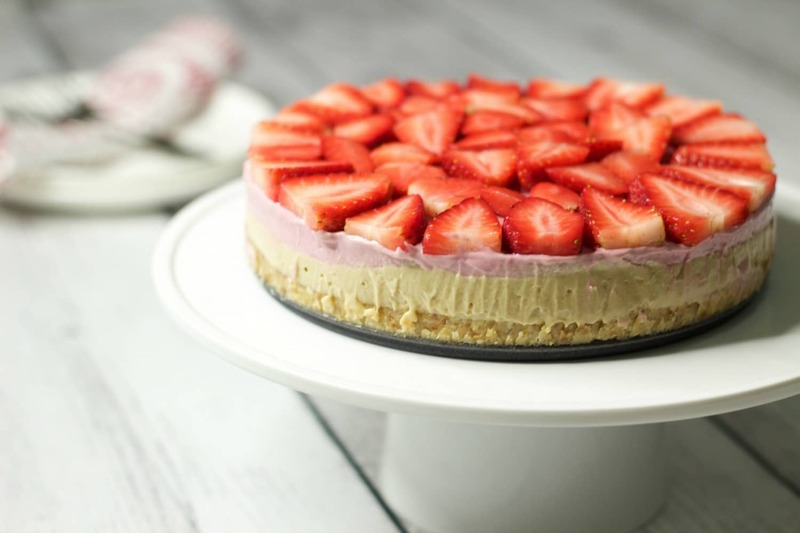 This raw strawberry cheesecake is 3 layers of pure heaven. It’s ridiculously rich, but in a seriously good way, in the ‘I can’t believe how good this is’ sort of way. 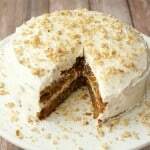 Every layer is pure decadent delight. 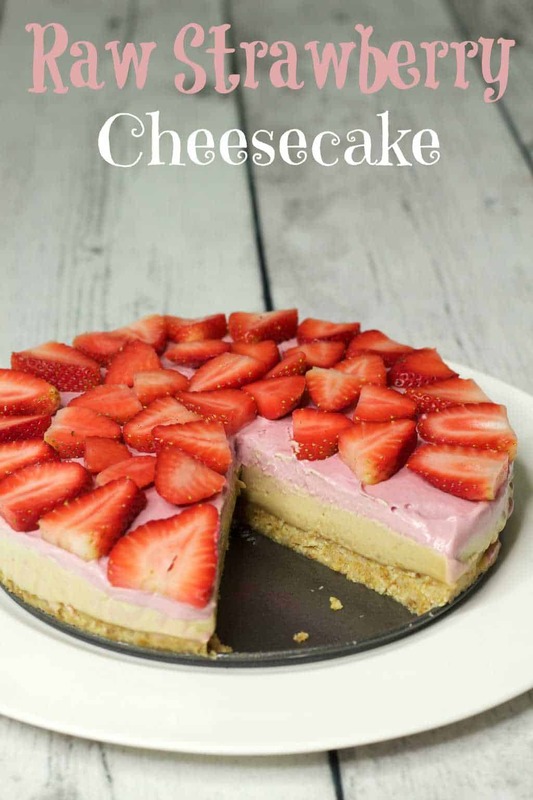 Smooth, creamy, sweet with just enough tartness and kick from fresh lemons blended with cashews to give it that fabulous cheesecake flavor. 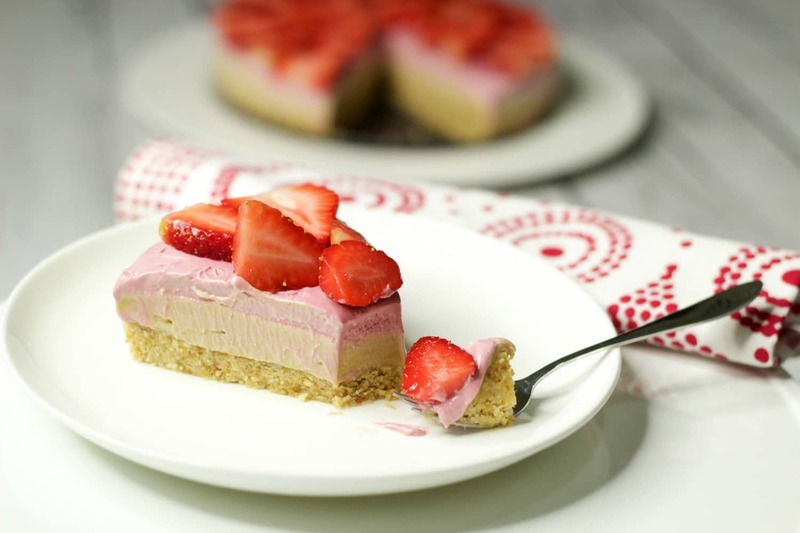 Now, a lot of people use coconut oil in raw cheesecake recipes. And sometimes I do too. 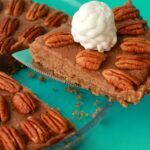 Coconut oil is great for raw desserts because it helps them to set more firmly. But in this particular raw cheesecake, I left it out. I decided there was enough good fat in this cheesecake to last a week, and since it has to be kept cold anyway, it sets pretty well even without the coconut oil. But should you feel inspired to, then just add in 1/4 cup of coconut oil to the ‘cheese’ part of the recipe, and 2 tablespoons to the topping. It will result in a slightly firmer set to the cheesecake. Otherwise just go ahead exactly as I have below! The best way to get it to set is to put it in the freezer until it has set completely, but thereafter you can keep it in the coldest part of your refrigerator where it keeps perfectly well for a few days. Alternatively if you want it to keep even longer than that, then slice it up and return to the freezer. You’ll need to thaw out your slice every time before you can eat it, but it’ll keep for weeks this way. So, let us know what you think of this recipe by leaving a comment and rating the recipe! 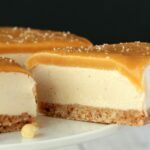 Check out our other fabulous cheesecake recipes like our vegan cheesecake with salted caramel fudge topping (also raw!) and our mini vegan chocolate oreo cheesecakes, and our caramel swirl cheesecake ice cream is also not to be missed! 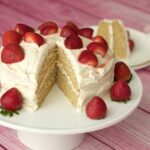 Sign up to our email list as well while you’re here for a fabulous free recipe ebook and to stay updated with all our latest recipes as soon as they’re posted to the blog! 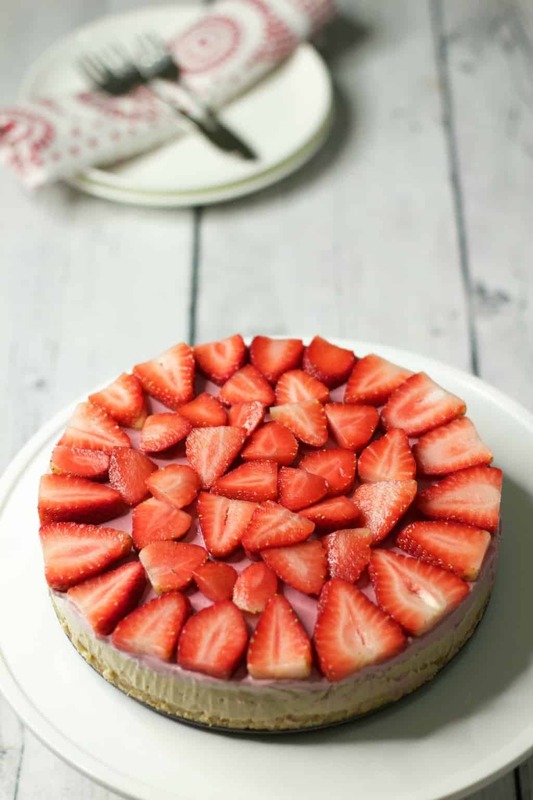 Gorgeous 3-layer Strawberry Cheesecake. 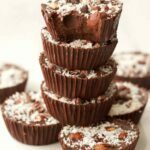 Raw vegan, dairy-free, gluten-free and unbelievably delicious, this is one you’ll want to make over and over again. Add the macadamias, cashews and pitted dates to the food processor and process on the S blade until a sticky dough has formed. Scoop out into a greased 8 inch springform pan and pat down until smooth. Place into the freezer to set while you make the filling. Place the 2 cups of pre-soaked (at least an hour) cashews along with the lemon juice, vanilla and date honey or maple syrup and blend until smooth. Pour this over the crust, smooth out with a spatula and return to the freezer. Allow this to set fairly firmly before you prepare your topping. 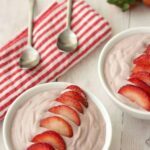 When you’re ready to make the topping, add the soaked cashews, fresh strawberries, lemon juice and 2 Tbsp date honey or maple syrup to the blender and blend until smooth. Taste test to see if it’s reached the desired sweetness (the sweetness will depend on the sweetness of the strawberries), if not, then add more date honey/maple syrup and blend again. 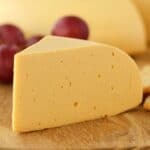 Pour this over the ‘cheese’ layer and return to the freezer to set solidly. When completely set, slice up fresh strawberries and serve. 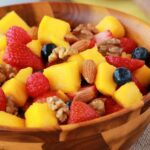 If you’re going to consume it within a few days, you can keep it in the coldest part of your refrigerator, but if you would like to keep it longer, then slice it and keep it in the freezer in a freezer safe container, and thaw out only as much as you wish to eat, when you’re ready to eat it. It will keep for weeks in the freezer. *The 2-hours of ‘cook time’ is for time spent setting in the freezer. I too am trying to avoid coconut oil for health reasons is how I found this. 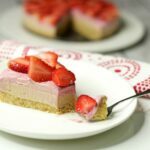 I have not tried this recipe yet but I wanted to share my technique for making raw cheesecakes. I use a silicone cake pan, round or square. I put the top layer in and let each layer freeze before adding the next layer and the crust. A few hours before the party I pop the cake out of the form, no need for grease and you have to do it while frozen. Then add any toppings. I normally let them thaw on the counter but I assume this one needs to stay in the fridge and thaw slowly overnight. This looks and sounds delicious! But I shouldn’t eat cashews, what would you suggest for a substitute? 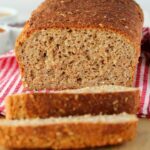 Super easy to make and tasted absolutely delishes! How’s the size of ur cake tin? !